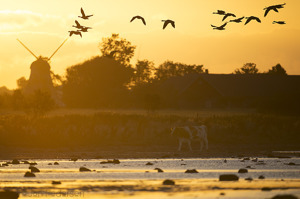 Sunrise - wetlands - in Halland, Sweden. After teaching advanced creative techniques for my level 3 photo-class I decided to search for early arctic waders on my way home. Very few and very skittish - so it became landscape instead. Waited for the sun, composition and settings all clear and when the geese came - action. AND as an extra bonus - a lovely cow.